Introducing…LSE Business Review: The top ten ways in which business firms and universities interact. 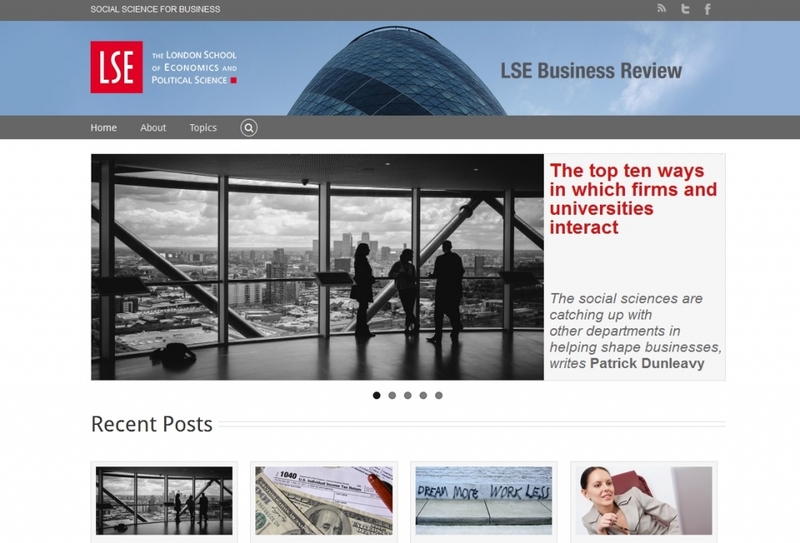 The LSE Business Review blog launches today, Monday 7 September 2015. It is an LSE-wide initiative to improve knowledge-exchange activities connecting academics with the business community — corporations, firms, business executives and managers. The cross-disciplinary blog is funded by the ESRC Impact Acceleration Accounts and will draw on business-facing and business-relevant contributions from across all LSE departments, alums, business leaders, think tanks and business-facing academics outside LSE (across the UK, Europe and USA), to foster the maximum exchange of knowledge. The primary audience of the LSE Business Review is the business community — corporate heads and executives, firms of all sizes and in all different areas of activity, professionals and professional bodies. On a secondary level, it will also aim to reach people in the not-for-profit sector, academics and prospective students. To kick-off the launch, Patrick Dunleavy introduces how universities and businesses are currently linked and the great potential for further collaboration. This post first appeared on the LSE Business Review and is cross-posted with permission. 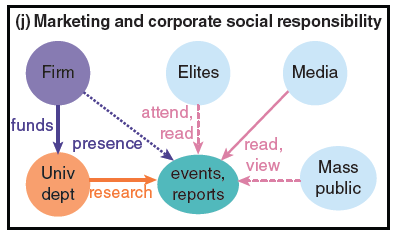 When working on a recent book, charting The Impact of the Social Sciences, my co-authors Simon Bastow and Jane Tinkler and I talked with dozens of corporate executives, scientists and academics about business-university linkages in the UK. In those conversations we found that many people on both sides of the fence tended to not see or minimize linkages at first. But the longer we talked, the more common ground and interactions would often be turned up. So it’s helpful at the outset of LSE Business Review to look at the top ten ways in which businesses and universities are now linked, and to consider which of these are open to and potentially fruitful for the social sciences. 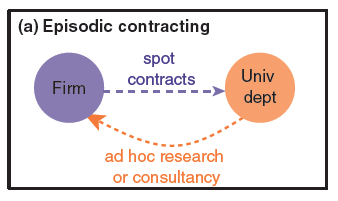 (a) With episodic contracting a firm encounters a problem where research could be helpful, does a quick search and ‘spot’ contracts with a university department for help urgently to solve that issue. The department undertakes a piece of ad hoc applied research or consultancy to meet the commission. 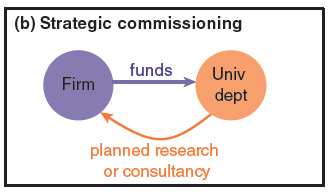 (b) Strategic commissioning goes one stage further because the firm plans its research or consultancy needs in advance, undertaking a more considered search, and committing somewhat more resources over a longer term (perhaps two or three years). Pursuing a mix of in-house research and outsourcing helps firms to balance their R&D portfolios, spread the associated risks of doing research in-house, and access innovation and new knowledge from outside. 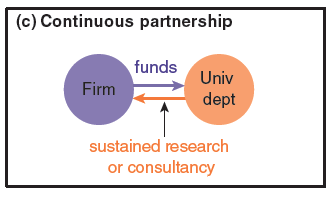 (c) Continuous partnership exists where the firm has a close and long-term relationship with researchers, providing a regular stream of funding that can translate into discrete projects, studentships and new equipment, and getting to know the department’s or lab’s staff and research capabilities in detail. The researchers also come to understand the firm’s procedures, priorities and capabilities in detail, and perhaps establish trust relations with particular executives (understanding the firm’s ‘politics’ more). 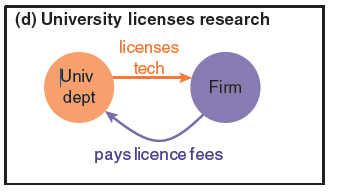 (d) When a university licenses research then the department or lab controls a valuable resource (such as a patented or otherwise protected piece of intellectual property) created by previous research, which the firm pays to be able to use. (e) Technology transfer involves government funding agencies who provide resources to the university side (such as state-of-the-art capital equipment or funding for post-doctoral researchers) on condition that the department or lab then collaborates with industrial partners, so as to transfer knowledge of new techniques or subjects to relevant companies (Klingstrom, 1986; Bower, 1992). 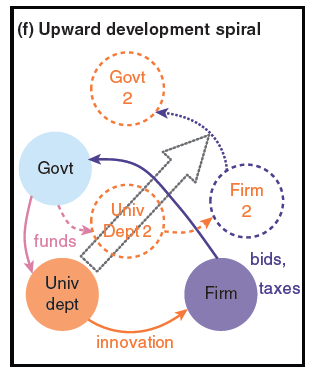 (f) An upward development spiral is something of a Holy Grail of technological development at regional scales. Here government supports university innovations that feed into industrial development (usually to firms located in the same region or city), in the expectation that employment and tax revenues will increase, with positive multiplier effects. 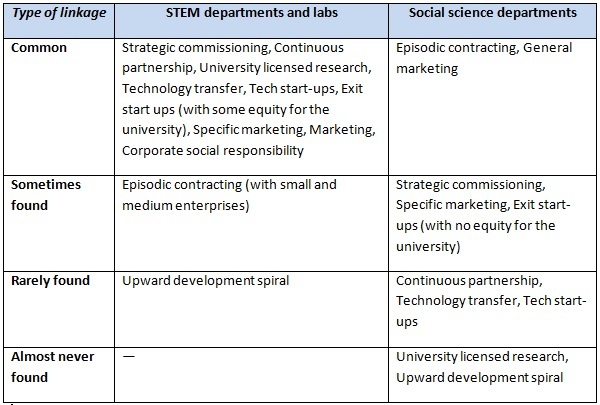 (g) An organized tech start-up from the university viewpoint involves a department or lab developing research with potential commercial application. 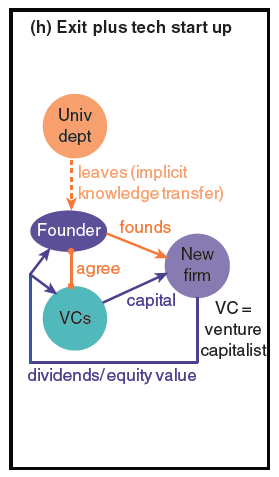 The university then does a deal with a venture capital firm, which may involve either private finance or in time an Initial Public Offering (IPO), so as to create a spin-out or ‘starburst’ company. (h) A start-up via exit is much more of a blow to the university side. Here a researcher who spots an industrial opportunity leaves the department or lab and negotiates individually with a venture capital firm to create the start-up company, presumably not using any IPR protected materials from their university employment. All dividends or equity gains flow back to the founder and investors here, with no formal return to the university unless the founder makes later donations. (i) Specific marketing collaboration occurs where a firm funds high quality research for charitable or corporate social responsibility reasons. 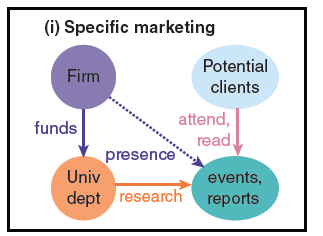 But firms may well expect that there will be specific marketing opportunities created by the research to bring its executives into conversation with potential clients, to demonstrate corporate social purpose in ways that attract custom, and to enhance the firm’s brand or reputation for foresightedness, acumen or competence in the field that the research relates to. (j) In more general marketing and corporate social responsibility the incentives for firms are far more diffused, simply incrementally building a brand with elite or general audiences that associate the firm with attractive or socially worthwhile research – which may lie a long way from its industry sector, much as if the company was supporting a symphony orchestra, an art exhibition, a medical charity, or an effort to alleviate world poverty. Given these ten key patterns of interaction, how are the social sciences placed in collaborating with business? We might especially want to compare them here science and tech disciplines, which have focused on collaboration far longer and far more purposefully? We found big differences in patterns of linkages across these two big discipline groups. Clearly the social sciences have much still to do, and one of the key aims of LSE Business Review is to help speed that catching-up process. 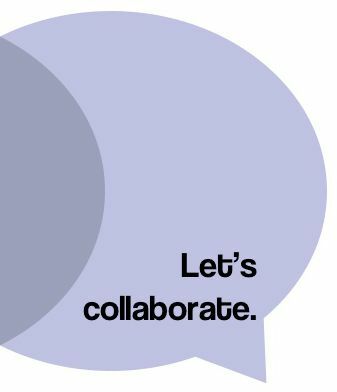 The good news for collaboration though is that in key sectors (like the IT industry, banking and retail) business executives are increasingly aware of the potential importance of evidence-based management, and of the role of social science research in underpinning that in the digital era. Patrick Dunleavy is the General Editor of LSE Business Review. Patrick is chair of the LSE Public Policy Group (PPG). Patrick is also Centenary Research Professor at the Institute for Governance and Policy Analysis, University of Canberra. He is a board member of the Campaign for the Social Sciences. His two most recent books (co-authored) are The Impact of the Social Sciences (Sage, 2014) and Growing the Productivity of Government Services (Elgar, 2013). He tweets at @PJDunleavy and @Write4Research. Interesting Article. The Big Issue is How to move from Words to Action; that is How UK Universities help the UK Local Governments and National Government achieve increasing convergence between UK National Development Vision and UK International Development Vision and this should include domesticating SDG in ways that improve UK Universities Teaching, Research and Community Service. The Challenge identified is nit just a problem in the UK but also a problem in other Developed Countries including US, Germany, France, Russia, Japan etc as well as all Developing Countries including Brazil, China, India, Nigeria etc. Now that LSE has taken up the gauntlet to tackle the Challenge, let all concerned Stakeholders shift focus away from problems and talking and shift focus towards solutions and Action. We do hope that bright prospects of success will not be squandered.